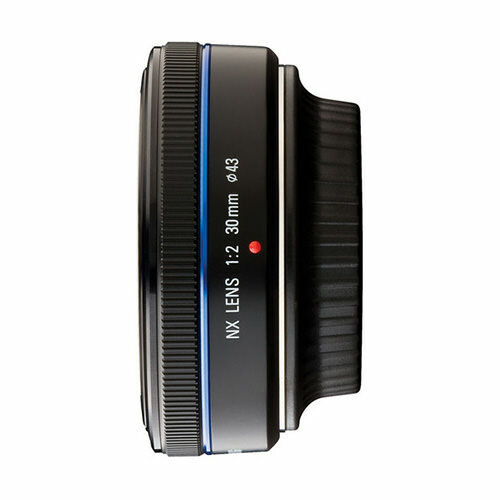 Lens Description: The Samsung EX-S30NB 30mm f/2.0 Standard Pancake Lens is an extremely valuable accessory for Samsung NX10 Digital SLR cameras. This ultra-compact lens has a focal length of 30mm, equivalent to a 45.9mm focal length in the 35mm film format. It has a maximum aperture of f/2.0 which makes it ideal for shooting in low lighting conditions and allows you to you to use fast shutter speeds to \"freeze\" action. This lens can be mounted to any camera with an NX mount.